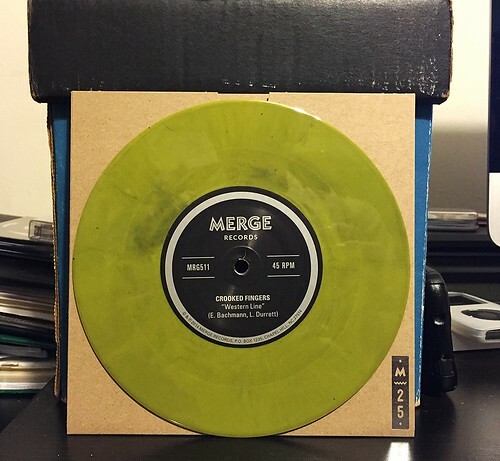 We're in the home stretch for the Merge Records Or Thousands Of Prizes singles series. For the November release they paired up Crooked Fingers and Spider Bags. Let me admit right up front that I hate Crooked Fingers. That band drives me out of my mind. Sure, it may simply be because Eric Bachmann was in Archers Of Loaf and Crooked Fingers sounds nothing like Archers. But I think even past that it's because I've always felt that Crooked Fingers was making pretentious music just for the sake of it. I'm sure I'm wrong, but I've tried to give them another chance again and again and I just never like anything they's done. Their contribution to this split is no different. "Western Line" is built over minimal rhythmic drumming, the occasional quick guitar overlay and harmonized lyrics that sound like their off of a band Paul Simon benefit record from the 80's. It's just not for me. On the flip side, Spider Bags are a band I find much more agreeable. While they don't knock my socks off or anything, their song "Into A Tree" benefits from being much more upbeat and cohesive. The cadence of the lyrics remind me a little bit of The Dandy Warhols, but just slightly. When compared to the other side of this record it sounds like the best song in the world, but in reality it's just ok.